If you're excited for more twists, here ya go! There's a new competition this summer which means Battle of the Block is gone - praise the BB gods! The BB Roadkill competition awards the secret winner a game-changing power: anonymously being about to nominate a third person for eviction. I really like this new twist as a way to totally throw off the game, especially anonymously which will breed super paranoia in the house. It also creates a lot of schmoozing and alliances to try to cover yourself from all angles, like Da'Vonne who is playing hard and fast but much slicker than last season. The vets are worried about being the minority but quickly are able to get Zakiyah, Michelle, Corey, and Tiffany on their side and form "The 8 Pack." The 8 Pack continue their dominance when Frank secretly wins the BB Roadkill competition to hold down buttons while "driving" and strip to their swimsuits. Irresponsible driving indeed, but worth it for the power. Frank keeps the powerful secret within his alliance and completes denies to Jozea and Paul. Probably wise to keep a secret from Jozea, who still hasn't figured out that running your mouth to the wrong person will get you nominated. But hey, he's no "kisser butter." Despite being at the highest of highs with his power, Frank and the rest of Category 4 have to wear pixel bathing suits as their punishment all week, lookin' like a bunch of naked Sims walking around the house. Frank wants to nominate Paul or Bridgette (a member of the newly formed "Spy Girls" trio with Natalie AKA Flirty Spy and Bronte AKA Wifey Spy). But since Paul would play in the veto to save himself, not an ally, Frank secretly chooses Paul as the third nominee this week, announced via a scrolling screen of houseguest headshots. 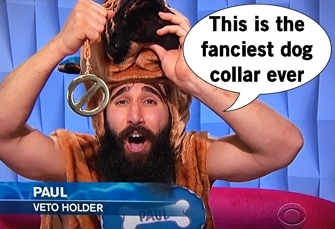 Everyone is shocked Paul is the third nominee and are bewildered at who could have the power. Jozea is extremely confident Michelle won the Roadkill competition and that his alliance has the numbers to take out Paulie, oblivious to the fact that his side is utterly screwed. The three nominees, HOH Nicole, Da'Vonne, and Corey (Nicole picked him specifically after drawing her own name, this season's upgraded twist to Houseguest's Choice) get to play in the first Veto Competition of the summer. Dressed as adorable dogs, the houseguests have to split on a platform and stack 40 doggy treats on top of their dog house within time limits. After a lot of spinning and abusing a sound board of doofus noises, Paul wins the veto and begins shouting a celebratory "woof woof!" because he can remove himself as a nominee. As Paul was nominated by the Roadkill winner, that winner gets to name the replacement nominee. 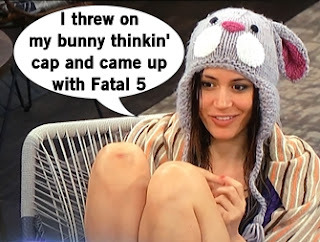 Frank's pool of nominees is slim pickins since Team Unicorn won safety in the premiere and the entire HOH's team is safe as well. But really it doesn't matter since oblivious Jozea is the target, with such little perception that he thinks HE is running the house with Frank following his commands. He even calls a house meeting in the Have Not room to declare that everyone should and will vote out Paulie... in front of Paulie's allies! While Paulie initially worries his alliance could turn on him, but his conversation with Jozea only confirms the fact the the delusional dude is out the door. Still unknown the the blissfully ignorant newbies, Frank chooses Bridgette, the terrible Spy Girl who got no dirt when trying to spy, as the replacement nominee because she's also the only option that isn't in the 8 Pack. Jozea and Paul aren't upset that Bridgette's nominated because she wasn't a 100% solid vote, but they assume they have the numbers with Zakiyah and Da'vonne (oops). Jozea's allies warn of a possible tie, which Nicole would break, and despite his overconfidence he tries to make nice with her. Some of the newbies begin to wonder if something is going on since the HOH hasn't made their usual grand declarations of who should go home. Bridgette's smack talk of Nicole gets back to her and the group wonders if someone more covert like her would be the better choice to send home since Jozea's game is 100% obvious. The girls are even swayed a little to consider switching their allegiance after being spoken to so condescendingly by Victor and Paul. But the Spy Girls are nothing compared to the women's alliance I'm backing: the Fatal Five. Da'Vonne, Nicole, Zakiyah, Michelle, and Tiffany realize that as four strong female players they could be the most successful all-girl alliance to play. I am into this. The house convenes for the live vote, which includes Paulie doing I guess a mobster impression? In a 7-4 vote, Jozea is evicted in the first blindside of the seasons. He hugs everyone silently and scurries out the door, probably super embarrassed. Julie Chen asks why he was silent on the way out and he gives a dumb answer, but blames Natalie for flipping (she didn't). Jozea is asking why Nicole was such a target and the answer is easy: she's the only returnee whose season he saw. Asked if he would do anything differently, he says making one person his best friend. 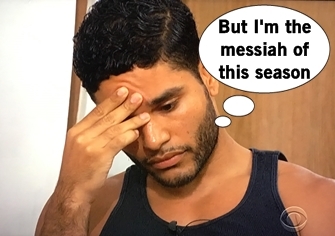 Well of course Jozea has a chance to return, as does Glenn! Julie Chen introduces the new twist: Redemption Island. Oh I'm sorry it's actually called Battle Back, which allows the first five houseguests to compete in head-to-head competitions to get back into the house. It's 100% Redemption Island from Survivor, or Top Chek Last Chance Kitchen - all those dumb second chance twists I truly hate. A new Head of Household has to be crowned, as well as securing safety for one entire team. The teams have to race across a balance beam relay-style, but if you fall you're out. 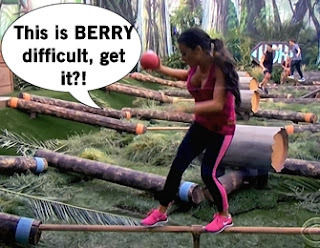 The team that gets to 40 berries first gets to send one person to grab the final blueberry, and that will secure the team security AND make the blueberry holder HOH. It's a To Be Continued competition so we'll have to patiently wait until Sunday to see the results... or you know, just tune into live feeds and find out in 11 seconds.